Berg Adventures kicks-off our Fall '04 season in Nepal with another great Everest Base Camp trek. 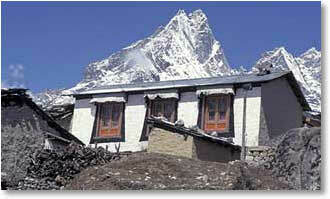 We'll also have a team attempting to climb Island Peak and Lobuche, so it should be a very exciting season! With BAI, a trip to the Khumbu, the homeland of the Sherpa People and the approach to Mt. Everest, feels like a journey "back home." 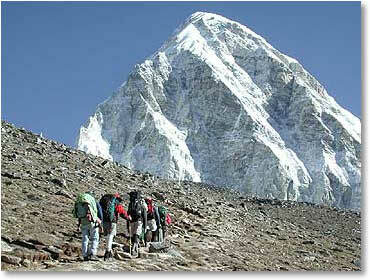 At last count our guides have a total of 25 climbing expeditions to the south side of Mt. Everest. At every turn our group is greeted with the friendly faces of some of our oldest and best mountaineering friends. Join guide Wally Berg and our BAI trekkers as we travel once again to the "Abode of the Gods" at the base of the world's highest mountain. Oct. 17 - "The Cataract Climb"